Exclusive Or - The Chip's Challenge Wiki - The Chip's Challenge Database that anyone can edit! Select one and stick with it for the rest of the level. Exclusive Or is the 46th level in Chip's Challenge Level Pack 4. It was created by Tyler Sontag. 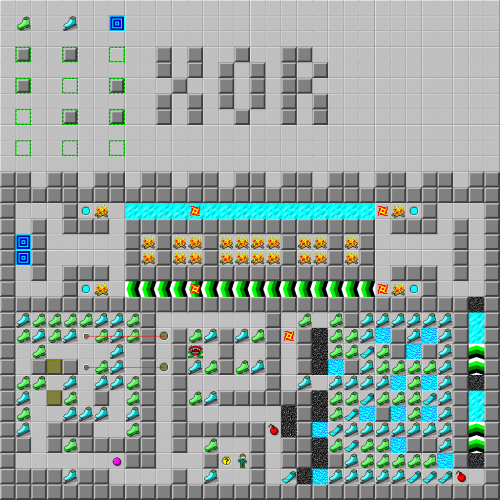 The title of the level is a reference to the logical operator of the same name, often abbreviated as XOR. The exclusive or operation when presented with two options means you can pick either one of either option, but strictly not both. As suggested by the level's hint, if you initially pick up ice skates, do not pick up any suction boots for the remainder of the level. Similarly, if you pick up suction boots initially, do not pick up ice skates. Flippers are considered a neutral boot in this level and can be picked up as needed on either route. The suction boots route is used for the level's bold route as it is slightly faster. Pick up the boots of your choosing and head to the west portion of the level. Maneuver the two blocks onto the brown buttons without picking up the set of boots you did not choose at the beginning. Then return back toward the beginning and head north from the starting point across two traps. Bypass the teeth to the right side, release it from the bottom then lure it south toward the bomb. At this point you are forced to pick up a set of flippers. In the next portion, you are to create a path for the fireball through the suction boots and ice skates maze to the bomb at the end without allowing it to hit water. Remember fireballs turn right when they hit gravel, boots, or walls. Exit the area from the bottom right corner after the fireball has cleared the bomb. In the final north portion of the level, reach the exit by selecting the ice path if you picked up suction boots, or the force floor path if you picked up ice skates. If you had picked up both sets of boots at any time during the level, the fireballs in this area would kill you before you could reach the end of either path.